One of the challenges gardeners have in Adams County is designing landscapes that offer bloom or foliage changes and a sequel of interest and color throughout all seasons. This is usually accomplished with careful planning and thorough research of a wide variety of plant materials. Combining evergreens and deciduous shrubs and trees along with annuals and perennials can usually create a landscape of ever-changing interest and color all year. One of the trees that I like to use as we transition from spring to summer to autumn is the sourwood, or oxydendrum arboretum. It is also known as the lily of the valley tree, or the sorrel tree. The botanical name is derived from the Greek word oxys meaning acid and drendon referring to the sour taste of the leaves. The sourwood is a native tree found predominately in the southeastern parts of the U.S., but it will grow as far north as Pennsylvania. In the wild, the sourwood is often found in well-drained soil above rivers or streams. The native sourwood will reach heights of over 50 feet, but cultivated specimens available in nurseries typically only grow to about 30 feet in height. The sourwood is a deciduous tree that has a pyramidal habit with drooping branches. It is a very slow grower that grows best in full sun with well-drained acidic soil. Sourwood will not do well in neutral or alkaline soil, and pH levels should be 4.0-6.0 for best results. The sourwood is considered by some to be one of our best native trees; it is even considered a good rival against the dogwood. The sourwood offers multiseasonal appeal. It produces beautiful lily of the valley-like flowers throughout July. The flowers then change to fruit capsules that accentuate the handsome maroon, scarlet, or plum foliage in the fall. Bees and butterflies are attracted to the bloom, and birds will eat the fruit seeds. In parts of southern Appalachia, one can even buy sourwood honey. The sourwood does not transplant well from the wild. Container or field-grown nursery plants thrive quite well under recommended conditions. Due to its compact height and habit, it works very well in small yards and can also be used as a patio tree offering some shade. The sourwood will not cause surface root problems as it matures; they work planted along edges of woods offering a very native look synthroid generic. The sourwood does best in full sun, but it will tolerate partial shade. The sourwood does not tolerate pollution so it is not a good choice for street plantings. Uniquely, the sourwood is a late blooming ornamental tree. This late bloom time helps with the transition into fall as its leaves change to a vivid crimson. As the tree matures, its bark develops an almost alligator skin-like appearance. The sourwood is not a common tree seen in Adams County, but there are quite a few outstanding specimens in the area. 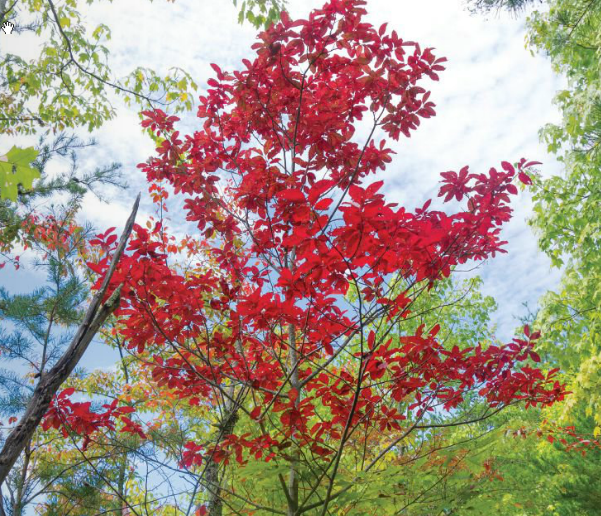 The tree should not be difficult to obtain from your local garden center and ought to be considered in your garden as a great summer bloomer with outstanding fall color.